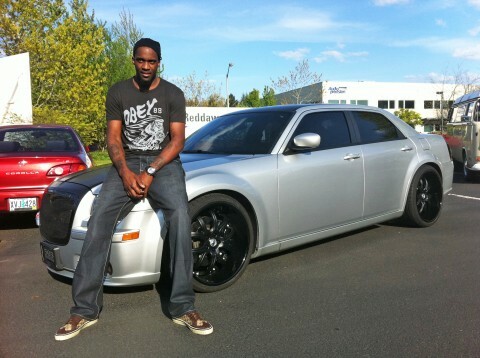 This is Martell Webster next to his two tone silver and black Chrysler 300C. We posted this car a long time ago on our website, and it looks like he modified it quite a bit since then. He changed the wheels to ASANTI ELT wheels in gloss black barrels and Matte black centers, Magnacharger Supercharger package, and fresh Alcantara Suede inserts in the doors. Martell, your not on your rookie contract anymore! What are you doing? Just sell this car and buy something nicer. I personally think you downgraded big time with the wheels. The ELT “mushroom” forging from Asanti makes a 22″ wheel look like an 18″ wheel. What’s the point of having deep lips if the entire wheel is black? Here is an awesome example of what an NBA salary can do for your car. 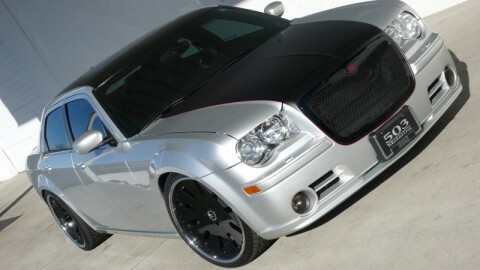 Martell Webster from the Trail Blazers brought his car into Tim from 503 Motoring and wanted him to customize his Chrysler 300C. Martell Webster walked in with a boring plain silver chrysler with cheap chrome wheels and left with one of the best looking Chryslers Ive ever seen; fully equpped with 22″ Aresto wheels, Strut Grill, and Matte Black Hood. These full face black wheels really complement this big car. Very good choice!